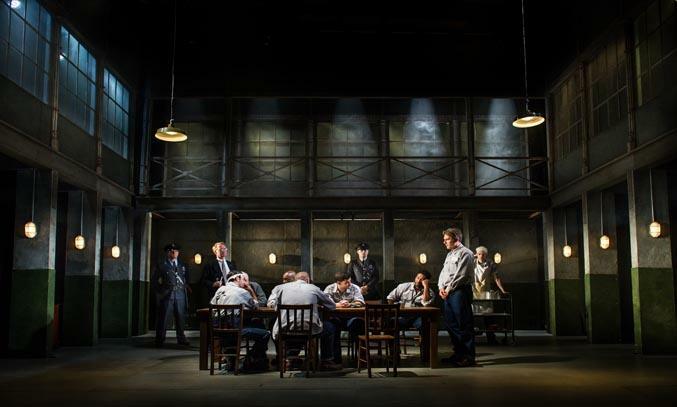 To celebrate the 22nd anniversary of the nation’s favourite movie, THE SHAWSHANK REDEMPTION has been given a new lease of life in a brand new touring stage production produced by Bill Kenwright. Based on the short novel by Stephen King, THE SHAWSHANK REDEMPTION tells the story of the Andy Dufresne (Paul Nicholls) a successful banker who is wrongly-incarcerated for the brutal murder of his wife and her lover. He is sent to the notorious Shawshank facility where he quickly learns that no one can survive alone. He strikes up an unlikely friendship with prison inmate Ellis ‘Red’ Redding (Ben Onwukwe), a man who at a price, can smuggle almost anything into the prison. However, when Warden Stammas (Jack Ellis) decides to bully Andy and exploit his talents for accountancy, Andy hatches a plan to take control of his own destiny. Brutal, harrowing, but utterly captivating, this thrilling production of THE SHAWSHANK REDEMPTION is escapist theatre at its very best. Owen O’Neill and Dave Johns’ adaption remains true to King’s original novel, brilliantly capturing the themes of desperation, injustice, friendship and hope, while welcoming influences from the Hollywood adaptation. Using lighting, simple ingenious set changes and vintage songs to move the story along, director David Esbjornson and his creative team lift this grim tale into a pacey piece of believable theatre. Gary McCann’s minimalist set provides the perfect backdrop for the prison-based thriller, with the stark, concrete walls intimating the confined, oppressive and claustrophobic atmosphere of a prison cell. Chris Davey’s moody and dim lighting transforms blank areas of the stage to indicate isolation and moments of dramatic action, while Dan Samson’s sound design of doors slamming and keys turning makes you feel as if you are behind the claustrophobic bars of a maximum security facility. But it is the exceptional performances from Paul Nicholls, Ben Onwukwe and Jack Ellis which truly stand out. Nicholls subdued performance as the mysterious introvert Andy Dufresne is earnest, subtle and constantly intriguing, offering glimmers of the character’s hidden genius behind his quiet and humble attitude. Ben Onwukwe is equally brilliant as Ellis ‘Red’ Redding, the prison’s go-to man for contraband. Robinson’s Red is much more of comedic incarnation than Morgan Freeman’s portrayal, but his performance is no less powerful or engaging. Nicholls and Onwukwe are aided by a strong supporting cast with Jack Ellis’ performance as the prickly and corrupt Warden Stammas and Andrew Boyer’s portrayal as Brooksie standing out in particular. The deliberate slow rhythm and pace, particularly in the first act, drags a little as the characters are being established but the production quickly picks up pace in the second half as the plot really starts to motor along. The touching finale will also leave you with a lump in your throat. If you’re a fan of the original 1994 feature film THE SHAWSHANK REDEMPTION starring Tim Robbins and Morgan Freeman, you’re sure to enjoy this production. A gripping tale of friendship, hope and endurance set in the reality of prison. THE SHAWSHANK REDEMPTION runs at The Lowry until 10 September.